This past week will be remembered for the cracks it revealed in the global monetary and trade building. At the Davos conference, the expression became unusually vociferous and purposeful with accusations and threats flying in all directions. Contradictory statements being mocked at and investment opportunities being knocked at. The one thing the brewing currency and trade wars are likely to inspire among the local populace is strong gold and silver demand in both its physical and paper forms. Speculators will be looking to capitalize on currency and market instability while private and institutional investors are likely to step up their hedging strategies. The inverse relationship between the dollar and gold has gathered strength both from the administration’s protectionist policies and the massive increase in deficit spending projected to result from recent changes to U.S. tax law. Equities remain strong, but the dollar has fallen, as might be expected, and gold prices have benefited with the drop in the U.S. dollar. The price of gold rose 13% last year, about half as much as the Dow Jones Industrial Average and less than half as much as the Nasdaq Composite. On Thursday it reached a 12-month peak at over $1,362 an ounce, following what have now been characterized as misconstrued comments by U.S. Treasury Secretary Steven Mnuchin on the Trump administration’s view that a weak dollar is a positive for U.S. exports. With potentially conflicting comments, the weakness of otherwise of The U.S. dollar from U.S. Treasury Secretary Steve Mnuchin and President Trump, the gold market didn’t know which way to run. In morning trade on Thursday, gold jumped to its best level since August 2016 touching a high of $1,365.40 an ounce after comments from US Treasury Secretary Steven Mnuchin at the World Economic Forum in Davos Switzerland sent the dollar lower. Mnuchin had to backtrack, but not particularly convincingly, on his weaker dollar being beneficial to the U.S. economy statement lest he be accused of talking the dollar down in conflict with U.S. assurances that it would not do so. The dollar was on track for its biggest weekly decline since May. President Donald Trump’s comments on Thursday that he wanted a “strong dollar” failed to lend much support, a day after Treasury Secretary Steven Mnuchin said a weaker greenback would help short-term U.S. trade balances. President Trump’s Davos statement suggested he was in favour of a stronger dollar, contrary to his earlier position on the currency, and following this the dollar rose, and gold fell on Thursday. “The dollar is going to get stronger and stronger and ultimately I want to see a strong dollar,” Trump said. Gold prices rose on Friday, after falling from 1-1/2-year highs in the previous session, as the dollar remained weak despite U.S. President Donald Trump backing a stronger currency. 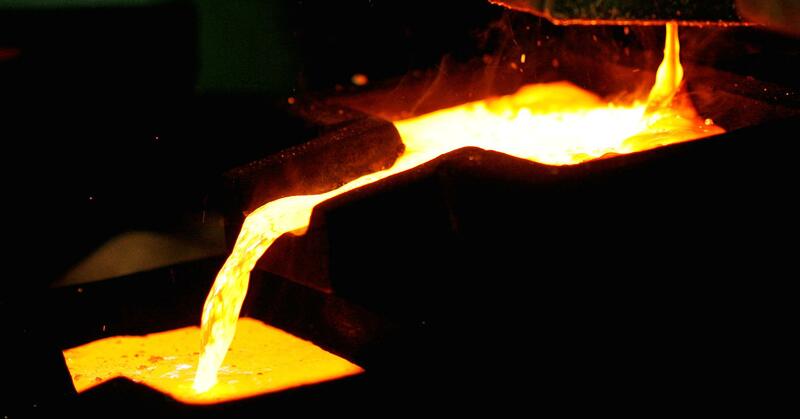 Spot gold had climbed 0.6 percent to $1,355.16 per ounce during Friday trading hours. The US dollar reverted to lower levels in Friday afternoon trade in the U.S. and gold rose back above $1,350 before activity in the futures markets and gentle dollar support brought gold back to heel and the yellow metal ended the week a fraction under the key $1,350 level. Gold and the US dollar usually move in opposite directions and the greenback has declined sharply against major currencies since Trump’s inauguration. The euro has gained 15% against the US currency, the British pound more than 13% and the Canadian dollar nearly 8% in little over a year. Gold has gained more than $100 an ounce since mid-December. Large-scale speculators increase their exposure to gold on derivatives markets by doubling net long positions – bets that gold will be more expensive in future – in the space of three weeks to the equivalent of 20m ounces. Retail and institutional investment in gold-backed exchange traded funds (ETFs) also continues to grow. According to data compiled by Bloomberg ETF vaults now hold around 2,250 tonnes, the most since May 2013, as investors piled in ahead of a US government shutdown. The break above $1,330 has given fuel to gold’s rally and the first target of this movement could be seen at $1,375 and if it crosses this mark then the rally could continue with targets at $1,390 and potentially at $1,415. To an impartial (relatively) external observer of the market, the gold price did appear to be trying to rebound back above $1,350 but kept being knocked back again. Whether it can build sufficient momentum to breach the $1,350 level permanently remains to be seen, but one suspects it will do so barring any major adverse news or data.